I’m afraid I wasn’t quite as taken with the movie as most others were (at least that’s the impression that I got last December). Yes, it was quite entertaining, but I also had some issues with it that altogether made it only my sixth-favorite “Star Wars”-episode, only beating out “The Phantom Menace”. One of my biggest complaints is how risk-averse it was. In order to appeal to those who only love the original trilogy, and hated the prequels, they pretty much present a “Best of the OT”-movie here, and pretty much copy “A New Hope”. I was especially disappointed about the new Death Star – the third one in the seventh “Star Wars”-film. Really? That’s the best that you could come up with? If this wouldn’t have “Star Wars” in the title, they would have been sued for plagiarism. I’m also not sure if I’m happy with the First Order as Empire-surrogate. Seeing the galaxy far far away in so much disarray 30 years after the original trilogy seems to make their victory there rather meaningless. Also, most of the First Order-characters didn’t really work for me. I was especially disappointed with Domhnall Gleeson, who I usually love, but here, he was so unconvincing that I had to refrain from bursting out into laughter. And while Kylo Ren might be one of the few original things about this movie, thus I don’t want to diss on him too hard, I’d challenge how anyone can hate Anakin Skywalker for his emo-behaviour, but give him a pass. Ultimately, none of the new bad guys (especially Supreme Leader Snoke; what a weird choice to blow their own horn for mostly refraining from CGI, and doing mostly practical effects, masks, make-up etc., but then do one of the new major baddies as CGI-character) worked for me, or felt threatening in any way. I also didn’t care for all the allusions to the original trilogy. A couple of references here and there (like the homage to the famous cantina-scene) would have been fine, but “The Force Awakens” is full of them. Sometimes they’re rather easy to spot, sometimes only the die hard-fans will notice them. However, I am a die-hard fan, thus I found one allusion after another, and whenever I did, it threw me right out of the movie. Instead of following the story, I stopped and thought about a different (IMHO better) movie, thus I never was immersed in what was going on for very long. I was also very disappointed by John Williams’ score, which is easily the worst of all of his “Star Wars”-soundtracks. And I thought that they really fumbled a certain dramatic scene. I don’t want to spoil it here, thus I have to be vague, but… lets just say that because of the way it was handled, I just knew what was going to happen, and thus wasn’t really in the moment – which is why it left me completely cold. And I was also rather disappointed that the old folks hardly ever interacted with each other – which is what I hoped for the most. Why bringing them back when you don’t see them all together in action? What a wasted opportunity. And even though it’s hard for me to put my finger on it, “The Force Awakens” somehow felt more contemporary and less timeless to me. This is especially true about the humor, which gave off a certain Joss Whedon-vibe. Usually, I like this kind of humor, but for whatever reason, IMHO it didn’t really seem to gel with “Star Wars”. But I guess that’s just me. 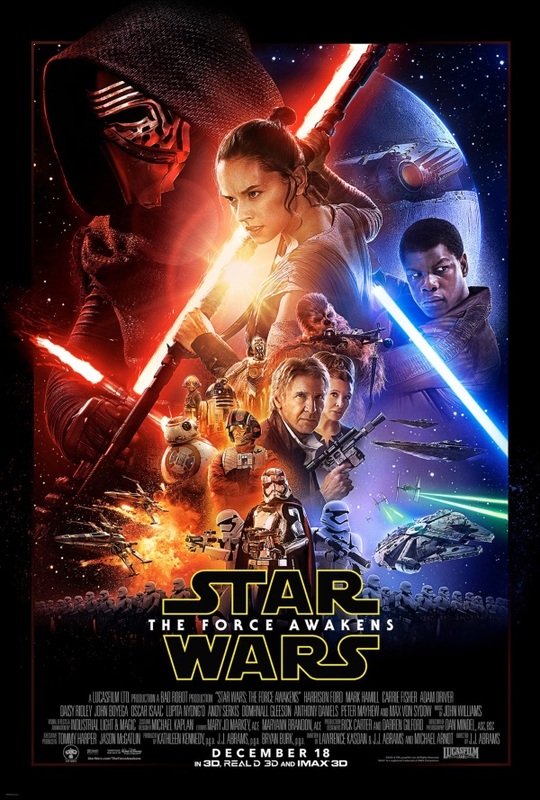 Ultimately, “The Force Awakens” felt more like a fan-film, or an imitation, to me. Say about the other “Star Wars”-films what you want, but – including the prequels – they always were quite different from each other. “The Force Awakens”, however, is some kind of “Best Of”-version of the original trilogy, which occasionally made me question why I should even bother with it, and not watch the movies it is mimicking instead. Having said all that, I can’t deny that “The Force Awakens”, overall, had me entertained. I also really loved most of the new characters, with Rey a particular standout. With Princess Leia, which was anything but a damsel in distress, “Star Wars” has always been on the forefront of bringing us strong female characters, but Rey really brings it up to a new level. I absolutely loved the scene where Finn is about to come to her rescue, only to note that she doesn’t need his help. Overall, I think it’s great that young girls now have a character within the Star Wars-universe who they can identify with, and look up to. I also really liked Finn, mostly because of the moral conflict that he’s facing. Poe, on the other hand, only was ok; I really wish they would have done more with this character, but there’s always episodes VIII and IX, I guess. I also can’t deny that it was a thrill to see the old characters on the big screen again. The effects were flawless, J. J. Abrams direction was spot-on, giving us a couple of beautiful shots and handling the action rather well, and yes, getting more practical effects again definitely is a development that I approve of. Overall, “The Force Awakens” probably is better when seen as a starting off point for the new chapter in the “Star Wars”-saga, than as an independent episode in itself. J.J. Abrams played it a little bit too safe for my taste, offering little in terms of new ideas, and mostly copying what has come before, but he paves the way for the others, leaves quite some room for improvement, and offers up an interesting and promising starting-off-point for the rest of the saga. Now, it’s up to Rian Johnson and Colin Trevorrow to pick up where he left off, and to make use of this setup – hopefully finally offering “Star Wars”-episodes that live up to the legacy, and that manage to enchant me as much as the original trilogy did. This entry was posted in cinema 2015, movie reviews, new releases and tagged 2015, Adam Driver, Carrie Fisher, cinema 2015, Daisy Ridley, disney, Domhnall Gleeson, Episode VII, Harrison Ford, J.J. Abrams, John Boyega, Mark Hamill, Oscar Isaac, science fiction, Star Wars, The Force Awakens, USA. Bookmark the permalink.